Cream is soft. Cream is demure. Cream is white with an extra dose of warmth. 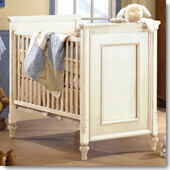 Cream baby cribs are a classic pick for the nursery. They impart a warm welcome to those precious new bundles of joy.